Grower’s Outlet was established in 1977 and for over 40 years. Ken Brendler and his family have strived to provide the finest produce from local farms as well as produce from around the world. Our unique Old Fashioned Store specializes in bringing you a complete line of local fruits and vegetables, as well as complete lines of pastas, hot cereals, dried beans, jams and jellies, nuts, granolas, grains, variety of trail mixes and honey (including raw honey). We also carry specialty items like Vermont maple syrups, Amish popcorns, handmade pies, breads and pastries from six local specialty bakeries and many other items, many of which are locally produced. We also make fresh hand-made customized fruit baskets while you wait, any size, any time, for any occasion. Spring brings you Fresh Local Strawberries, Cherries, Asparagus, as well as Hanging Flower Baskets, Bedding and Vegetable Plants, just to name a few. Summer brings you Fresh Local Tomatoes, Green Beans, Peaches and Pears, Hermiston Watermelons, Corn, Canning supplies and all the other delights that come with the summer. Fall brings you Fresh Local Apples of every variety, a complete line of Winter Squash, potted Mums and a complete line of fall decorations such as Corn Stalks, Gourds and even Hay Bales. It also brings our own Pumpkin Patch and Corn Maze that’s a favorite for kids of all ages. Free to the public. Bring your camera for the many picture opportunities. Winter brings you a complete line of hand packed Holiday Fruit Baskets to choose from. They make great gifts for your family, friends or business customers. We have them ready to go or you can have them custom made to your liking. You can buy one or order as many as you need for the Holidays. It also brings our Huge Christmas Tree Lot. We have hundreds of trees all standing up, so you can easily see for yourself which tree works best for you. We also have hundreds of Wreaths, big and small to choose from. It’s truly the nicest tree lot in the city. 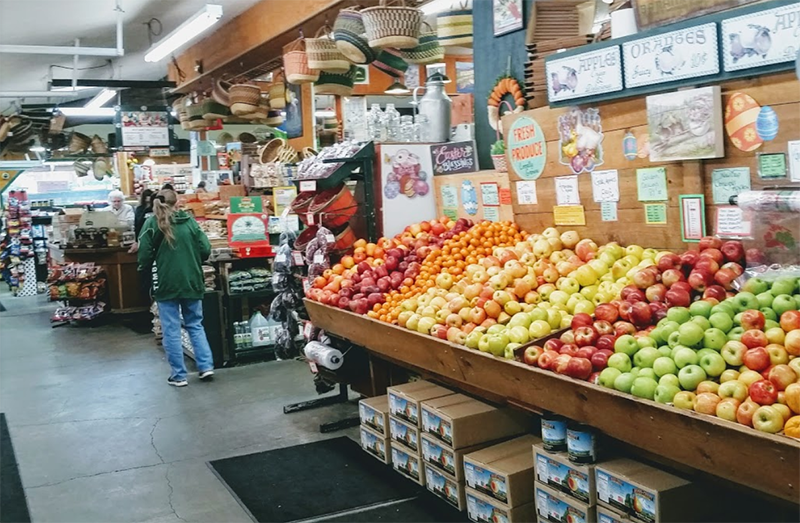 Come in and experience for yourself the many unique items our Farmer’s Market has to offer.